The Side Door Jazz Club in Old Lyme opens its door this Friday and Saturday nights to 2 fine trumpeters. First up is Jeremy Pelt (pictured left) and his Face Forward ensemble. Pelt, who is on the faculty of the Jackie McLean Institute at the Hartt School, is a fine player who blends numerous styles into his original music. The California native studied at the Berklee School of Music and went on to work with groups led by Roy Hargrove, Greg Osby, and Ravi Coltrane as well as the Mingus Big Band. Since his 2002 debut CD, Pelt has produced 11 recordings for labels such as MaxJazz, Criss Cross, Smalls Live and, most recently, HighNote. The Face Forward ensemble, named for his latest release, mixes electronic and acoustic instruments plus elements of jazz, r'n'b, soul music and more into a highly listenable stew. To find out more and the talented trumpeter/composer, go to www.jeremypelt.net. On Saturday, Etienne Charles returns to The Side Door (he was member of Rene Marie's band that appeared just a few weeks ago). Born in Trinidad and raised in Florida, Charles, who is still in his 20s, studied with Marcus Roberts and has worked with saxophonist Benny Golson, Roberta Flack, Wynton Marsalis, and Maria Schneider. He has created 3 CDs for his own Culture Shock label, the latest being 2013's "Creole Soul". Charles possesses a bright tone, a sound which serves his music, a delicious gumbo of Caribbean, New Orleans, blues and jazz, so well. He's now on the faculty of Michigan State University while maintaining a busy performance schedule. To learn more about the musician, go to www.etiennecharles.com. For tickets to either one or both of these shows, go to thesidedoorjazz.com or call 860-434-0886. 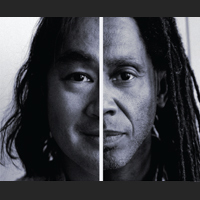 Firehouse 12 in New Haven presents the duo of Brandon Ross (guitars, banjo) and Stomu Takeishi (acoustic bass guitar) in concert this Friday May 30. They are touring under the name of For Living Lovers and in support of their debut CD "Revealing Essence" (Sunnyside Records). The album, much of which was recorded in the Firehouse 12 studios by Nick Lloyd, is filled with haunting melodies, quiet solos, fine supportive work from Takeishi and intriguing ideas from Ross. The music is dream-like, rarely forceful but emotionally powerful. Ross, who has worked with Henry Threadgill and Cassandra Wilson (among others), plays acoustic guitar in ways that suggest both Derek Bailey and James Emery without sounding like either one. Takeishi, who played alongside Ross in Mr. Threadgill's ensemble, has also worked with pianist Myra Melford and cellist Erik Friedlander. His bass lines are clear and clean, with round tones that fill the tunes. For Living Lovers plays 2 sets - 8:30 and 10 p.m. - for more information, go to firehouse12.com or call 203-785-0468. Vocalist Karen Frisk, a native of Cromwell, CT, brings her fine Quartet to The Buttonwood Tree, 605 Main Street in Middletown this Saturday (5/31) for an 8 p.m. performance. Ms. Frisk, who possesses a 5-octave range, started singing at a young age in her church choir and in community theater productions. She went on to study both piano and voice, moving to Cape Cod, MA, performing there and in Boston. She's living in Connecticut again and performing throughout the Northeast. Her excellent band includes pianist Kent Hewitt, the great bassist Brian Torff, and drummer Rich Tortorigi. To find out more about Ms. Frisk, go to www.karenfrisk.com. For reservations and ticket information, go to www.buttonwood.org or call 860-347-4957. Bassist Jeff Denson, who has worked and recorded with Lee Konitz plus is 1/3rd of the trio Minsarah (with pianist Florian Weber and drummer Ziv Ravitz, has issued a most uplifting duo recording with pianist Joshua White. "I'll Fly Away" (pfMENTUM Records) is a album of gospel tunes, several of which the bassist played at the funerals of his grandmother and father. The title tracks - 3 versions of the Alfred Brumley tune - range from the opening Fats Waller meets Charles Ives version to the deep blues of the second reading to the manic all-out swing version that closes the CD. It's not that White or Denson are being facetious but more that they are celebrating the joy that the music brings and the good memories of the people who passed. Denson's bowed bass reading of "Amazing Grace" stresses the beauty of the melody while going on to give the tune the feel of an Appalachian folk tune. His other solo piece, "Crying In The Chapel", is wonderfully melodic, getting quite bluesy at times. The duo is pensive on "What A Friend We Have In Jesus" and take "When The Saints Go Marching In" on a jaunt that runs the gamut from hard-bop to traditional. Joshua White, a native of Southern California, is a splendid pianist who has worked with bassist Mark Dresser, trumpeter Ambrose Akinmusire and guitarist Anthony Wilson - he currently leads a quartet that features saxophonist David Binney as well as drummer Mark Ferber. He and Jeff Denson have an excellent rapport, supporting each other and sometimes playing independently. 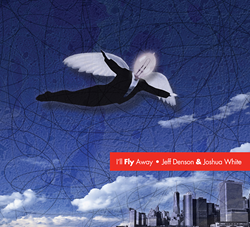 "I'll Fly Away" is filled with fine religious music but should appeal to music lovers of all faiths. For more information, go to www.jeffdenson.com. Saxophonist Rich Halley lives in Oregon and enjoys hiking through the mountains in the central part of the state, understanding the majesty of nature and man's role in both destroying and protecting his environment. He also leads the Rich Halley 4, a group that features Michael Vlatkovich (trombone), Clyde Reed (bass) and his son Carson (drums). "The Wisdom of Rocks" (Pine Eagle Music) is the quartet's 4th CD in 4 years and may be the best of a very strong bunch of recordings. There are 2 short group improvisations, a duo for tenor and drums, and some of the strongest rhythms you'll hear this or any year. The band comes blasting out for the chute with "The Atoll" that has the drive of the music created by the Vandermark 5, a hearty tenor solo and a forceful trombone solo. The rhythm section pushes with great intensity without losing its focus. The title track has a "cool" feel and a wonderful blowsy 'bone solo. One can see the band contemplating the heavens on "Faint Scattered Lights", a short ballad with an insistent throbbing beat and moaning sounds from the sax, 'bone and bowed bass. There's a ton of funk on "The Get-Go" and a deep sense of the blues on "Heat In May", featuring a subdued tenor sax solo. More blues can be felt and heard on "Radial Symmetry" but this time it burns with a fever; the saxophonist certainly can stoke the fire while the trombonist gets pretty hot himself. The program closes with the group composition "Conversation In Blue", a short piece that reminds this listener of the mid-50s work of Jimmy Guiffre and Bob Brookmeyer but with a bit of an edge. 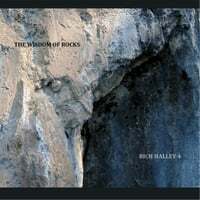 The music on "The Wisdom of Rocks" feels both new and familiar. The has worked together long enough now to know each other's strengths, understand how to support and egg each other on, and feel that that the music does not need to be complicated to be creative. The music of the Rich Halley 4 does satisfy the soul - to find out more, go to www.richhalley.com.